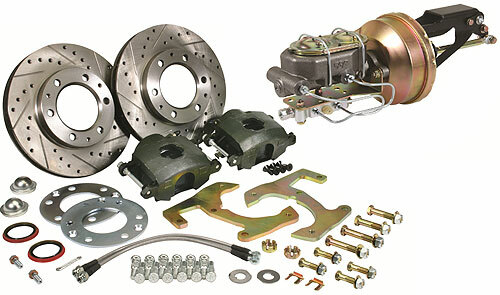 Our 6-lug disc brake kit contains all you'll need to put modern discs on your stock 1/2 ton spindles, and uses your stock hub. The 1-1/4" thick, 12" rotor uses a GM full-floating caliper. The 8" single diaphragm booster master cylinder and proportioning valve mounts in the stock location. We recommend that you upgrade the stock ball bearings to tapered roller bearings when using this kit. Some stock wheels may rub the calipe, it may be necessary to use a spacer. May not work with some stock wheels. Also, 1947-50 trucks may need to drill out lower spindle hole from 7/16" to 1/2". Note: Frame mount brake boosters may require #CP9424 transmission mount.